christytomlinson: Canvas Tutorial... The She Art Workshop... and a Giveaway! Canvas Tutorial... The She Art Workshop... and a Giveaway! Wowzers! A lot going on today on the blog! We have a tutorial, the debut of "The She Art Workshop" and a giveaway! First things first! Last week I had so much fun creating this Mixed Media Tutorial for you all! And guess what? It's ALL video.. yipee! So you get to see me in action.. from start to finish creating the canvas.. how fun! Disclaimer: please don't mind that during this video I am: in my garage AND my pj's AND that I sometimes sing my words AND that I continue to say Modge Podge even though I KNOW it's Mod Podge! lol.. old habits die hard I guess! Whew! glad to get that off my chest! Now onto the canvas we are doing to be making today! It's called "Love is in the Air" and it's a 10"x10" mixed media canvas using the January Frugal Fab kit from my website Scarlet Lime! Before I show you the video..I have to give a HUGE shout out to my (uh hum.. single) baby brother, Van Jr (or VJ as we like to call him). I was felling pretty cool that I had managed to edit a video and put some music to the start of the video, but then he came over and looked at it and said he would tweak it just a bit for me. Um.. tweak it? HE MADE IT A GAZILLION TIMES BETTER! All of the music you hear on the video is his! On his guitar! He sat there right in my office and mixed it all! He is awesome. He not only put music to all the segments but he fixed the sound so it doesn't sound like I am in my garage! lol Amazing. THANK YOU VJ!!!! I LOVE YOU!! (and if you are single and living in the Shelley, Idaho area..he's an awesome catch! :)). The video ended up being a little bit too long, so I had to create it in two parts. Here is Part 1 of the video and then the link for the second one is below! OKay.. now onto even MORE NEWS!!! I am soo excited to officially announce the launch of my new e-course, The She Art Workshop!I seriously can't tell you how stoked I am to offer this class! I have loved painting since I can remember and still remember the day my first book was published in Micheal's! (clear back in 2002.. man does that makes me old? lol). But I still love it today! Love creating and painting and love using other mediums besides just paint on my canvases. So I am excited to share what I know whith you and what I have learned over the past 10 years. Can't wait! The She Art Workshop is presented in three parts. Week one: Getting Down to Basics! I will show you all the in's and outs of how I create my backgrounds including unique and thrifty item you can use use AND tricks and tips of using household objects for texture! I will also show you how to create simple dresses, faces and hair using paper, as well as tips for giving your girls a more "painted" look. We will finish it off with learning how to doodle to finish off your project. Week two: All about the Layers! This week, we will get a little more creative and I will show you how to create layered clothing, how to personalize hair, and layering techniques for backgrounds. We will also add other items to our canvases (like birds, trees, houses, etc), to make a more complete look. Plus some creative writing tips for creating your own she words and phrases to fit the person you are painting it for. Week Three: Making it Yours! In this week I will show you how to create a girl based on a photo of YOU and your personality! You will use your picture (I will show you one of mine) as inspiration to sketch and design a girl that represents who YOU are. When you are done, you will have a portrait that simpy portrays how wonderful you are. I will also show you She Art projects that I did using other surfaces like tags, wood, bags, books, and more! This class will have OODLES of never before seen "She Art" inspiration, just for you! It will also include downloads Pdf's of "She Art" words and phrases you can use on your art as well as templates for clothing, faces, and legs. Plus some fun clipart you can use on your She Art Projects as well! All instruction will be in Video format, so you can stop and rewind as needed. I am also excited to announce that Scarlet Lime (my on-line papercafting and mixed media kit club), will also soon be carrying mixed media kits on our Scarlet Lime Website (starting Mid February). I will send out an email to participates when we do, and you will have first dibs! We will have rubon kits, paint kits, canvases and other fun mixed media items. Don't forget our regular papercrafting kits work awesome for these projects as well! The She Art Workshop will begin on March 1st and will be open for an additional 3 week after the class ends (so 6 weeks total availability). You will also have access to a flicker group to share your art with others in the class! I will be available for help at anytime during the class via email and will be in and out of the class forum, checking for questions or help. I am SUPER excited about this class and I can't wait to share with you all my techniques. Seriously excited.. thanks for letting me share with you! Want to join me? Registration starts today and ends February 27th. Classes begin February 28th! Wahoo! So who wants to win this a spot into this class? Simply post a comment on today's blog and next Monday we will announce the winner! Make sure to come back tomorrow when I show you some Thrifty finds that go perfectly with the Vintage Curtain Moodboard theme from yesterday.. love it! See you tomorrow! oh and don't forget to get entered to win! I have only just discovered art journaling and mixed media -- makes me breathless! I would so love to be able to win a place in the class! Thank you for the opportunity! You are a very talented artist and teacher. Hope I win, but good luck to all who enter. I am loving your style and the way that you make it seem so do-able. I am looking for 6x12 canvases here in Switzerland without much success yet. Will keep you posted. Really looking forward to the workshop. 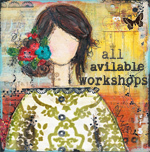 I would love a chance to take your workshop. Beautiful work. Your art is adorable. I hope to win a spot but will sign up anyway. It looks fun! Ented and make everything look easy. Would love to win but will be checking out your website again and again! Would love to win a free class......I feel pretty intimidated using paint so I need help lol. Thanks for the chance to win and forr the awesome tuts! SOO Glad I found you from ScrapScene! Your work is very inspiring and I'm excited about the chance to win a spot! Just saw your "Love is in the Air" tutorial and loved it, love how you make it so fun and simple. Thanks so much for the chance to win! Can't wait 'til Feb 28!!! I just found your website from Rhonna Design's website. This is great stuff! I am really excited to be here! It looks like a lot of fun!